Roy Horniman. ISRAEL RANK. The Autobiography of a Criminal. Chatto & Windus, London 1907. The film is the greatest work by Ealing Studios and appears on the Time magazine top 100 list as well as on the BFI Top 100 British films list. In 2000, readers of Total Film magazine voted Kind Hearts and Coronets the 25th greatest comedy film of all time. In 2004 the same magazine named it the 7th greatest British film of all time. Directed by Robert Hamer, something of a poet, latterly a dipsomaniac but one of the British cinema's greatest directors. One of his poems can be found at our shop website. He was published in 'New Verse' and also while at Cambridge in 'Contemporaries And Their Maker' (along with the spy Donald MacLean). As for anti-Semitism: Horniman’s hero is half-Jewish, his Jewish father having married a daughter of the aristocratic Gascoyne clan. Horniman, himself of mixed ethnicity—according to Kingsmill, his father was paymaster in chief of the Royal Navy and his mother “a member of the Greek aristocracy”—uses his hero’s ancestry to poke quiet fun at the casual bigotry of Edwardian England.... Four years after the defeat of Nazi Germany, however, a comedy about a Jewish serial killer would scarcely have been acceptable—least of all at Balcon’s studio. Israel’s surname had to go, too: Ealing’s films, after all, were distributed by the Rank Organization, chairman, J. Arthur Rank. So Israel Rank became the half-Italian Louis Mazzini. 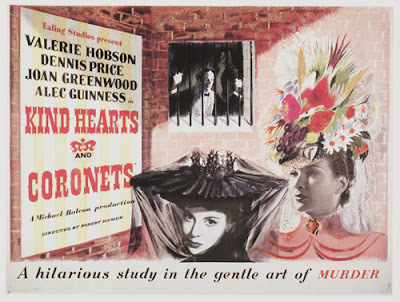 Kind Hearts and Coronets retains the essential plot of Israel Rank and most of its characters....the plotting is far more varied and inventive: Israel dispatches most of his victims with poison—not the most ingenious, or cinematic, of methods—where Louis uses explosive caviar, arrow, weir, shotgun, and so forth. Israel is arrested for the bungled murder of his final victim, Earl Gascoyne, whereas Hamer and his co -screenwriter, John Dighton, introduce the delicious irony of having Louis convicted for the one murder he didn’t commit." Alec Guinness said that he was originally offered the parts of only four D'Ascoynes. "I read [the screenplay] on a beach in France, collapsed with laughter on the first page, and didn't even bother to get to the end of the script," he recounts. "I went straight back to the hotel and sent a telegram saying, 'Why four parts? Why not eight!? Roy Horniman's papers are at the University of Reading in 27 boxes, waiting for a biographer to step forward. He was for some time the owner of 'The Ladies' Review', a keen anti vivisectionist and a member of the British Committee of The Indian National Congress. His dates are 1874 to 1930. He acted in many London theatres but his main talents lay in management and authorship. For a time he was tenant and manager of the Criterion Theatre and he wrote many original plays and adaptations of his own and others' novels. In later life he wrote and adapted for the screen. Hamer must have found his book somewhere because he is credited with seeing its movie potential. Hamer's own copy (marked up) would be a nice find. Horniman wrote several other books, two of which are in Bleiler including the occult novel 'The Sin of Atlantis' (1900) and 'Lord Cammarleigh's Secret: A Fairy Story of To-Day' (1907) Both are £100 books in excellent condition, a lot less in ordinary condition. 'Lord Cammarleigh's Secret' is less easy to find and according to EFB deals with reincarnation, magic and witchcraft. All his books are unknown to Locke which could mean they are fairly light in the fantasy department. Robert Hamer also directed the amazing Kent based noir ' 'The Long Memory' (from the Howard Clewes novel) and 'Father Brown,' he was described by one earnest film guide as 'the greatest miscarriage of talent in the British Cinema.' He had, as they say, a problem with alcohol. VALUE? Search me. It has to be £300+, not a thousand pound book however. A jacket would take it there but would be a minor miracle. It is (according to uber runner Martin Stone) in a pale pinkish cloth that is vulnerable to soiling and browning, so nice copies are very difficult. Somebody wants £200 for another Horniman title but on examination he is a relister who would put $100 on a Joan Fonda workout book. I would buy a copy in the low hundreds in nice condition in a provincial bookshop but would probably not leave punching the air. Trivia. Look out for the young Arthur Lowe (cult hero Captain Mainwaring in Dad's Army) as a tabloid reporter in the last 2 minutes of the film. "Israel Rank" is a very elegantly written novel, but quite different from the film. I think that the film tightens the story and improves upon Roy Horniman's characters. Nevertheless the book is quite a gem and it took me a long time finding it (bought some years ago). My copy is the Everyman edition - is it worth anything? I've rechecked my copy and it is in fact the 1948 Eyre & Spottiswoode edition - it is not a reprint. It was published in their 'New Century' editions. I've probably devalued it by sticking a bookplate in it, otherwise it is in good condition with the paper jacket. It still cost just six shillings (30 new pence) when I bought it in the early 1960s. If EFB says Lord Cammarleigh's secret deals with reincarnation, magic and witchcraft he is wrong, though The Sin of Atlantis and The Living buddha do. Lord Cammarleigh's secret is a companion to Israel Rank: in this case the hero, an unsuccessful actor, blackmails his way to a seat in Parliament, a private income and marriage to Lord Cammarleigh's neice. I'm very surprised this book appears to be so rare; I got it from the local library with no problem at all. I have been trying to track a copy of this book for ages and one just came up on ebay! !